Link Up and a Giveaway! Welcome to another NTT, y'all! I am working on a new quilt of course, but right now the fabric is sitting in cut pieces, just waiting to be turned into blocks. I'm hoping to make some serious progress on them tonight so I have something to show you! So, in the absence of progress photos, let's get right to the giveaway! 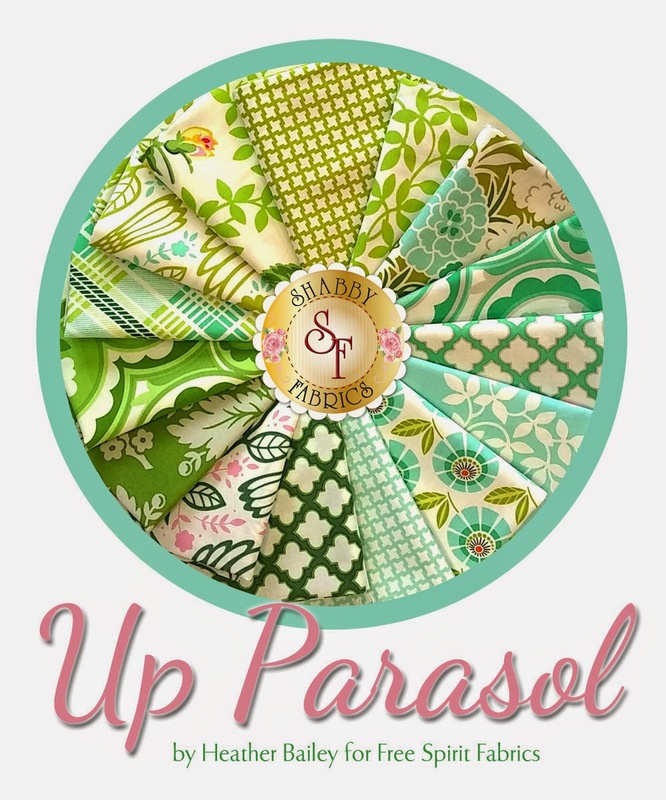 Shabby Fabrics is offering a fat quarter bundle of Heather Bailey's Up Parasol collection in the Summer Rain colorway! I just LOVE this fabric line. The colors are so fresh and pretty! To enter, just enter a comment below! I'll announce the winner at next week's party! **Be sure to leave your email address if you are a no-reply blogger! Speaking of parties- let's do it! Last week's link up had so much eye candy! 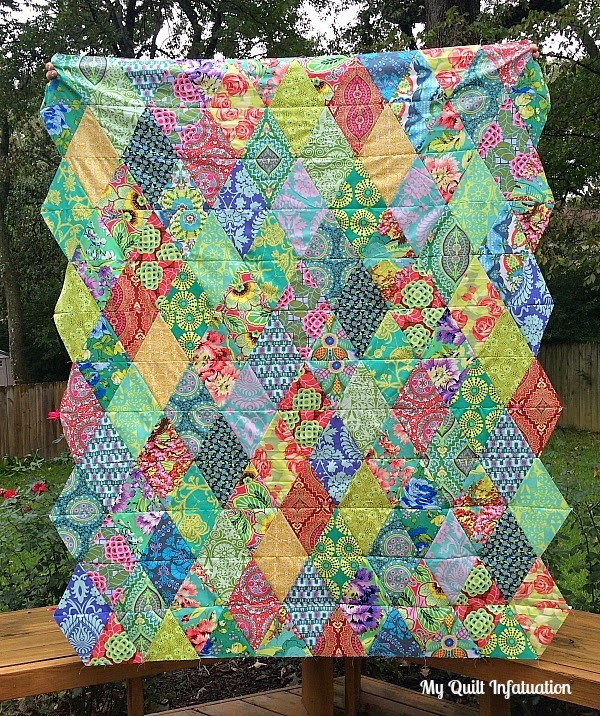 Katie Mae Quilts showed off her finished Spin Cycle quilt- love!! These yummy little granny squares from Porch Swing Quilts are just too cute! 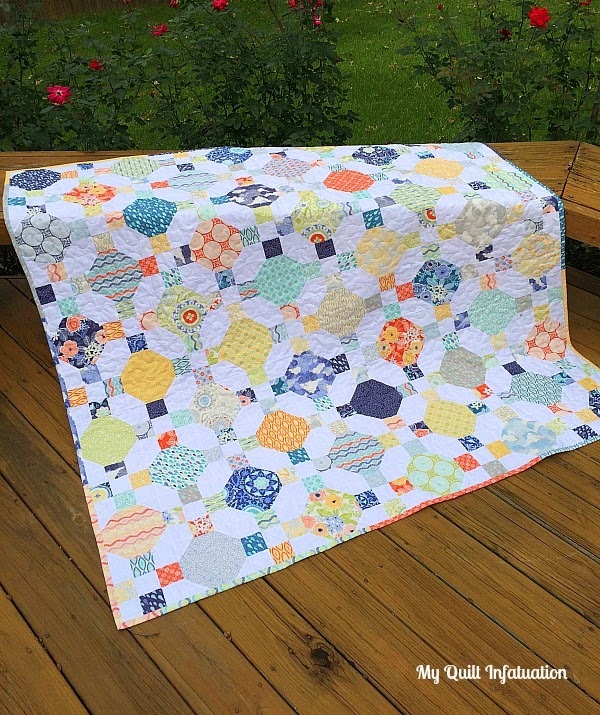 and this Quarter Log Cabin quilt by Marries Makes Things is so sweet! 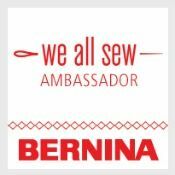 So, time to show me what's going on in your sewing space this week! The Memphis area has only one real quilt show each year (that I know of). 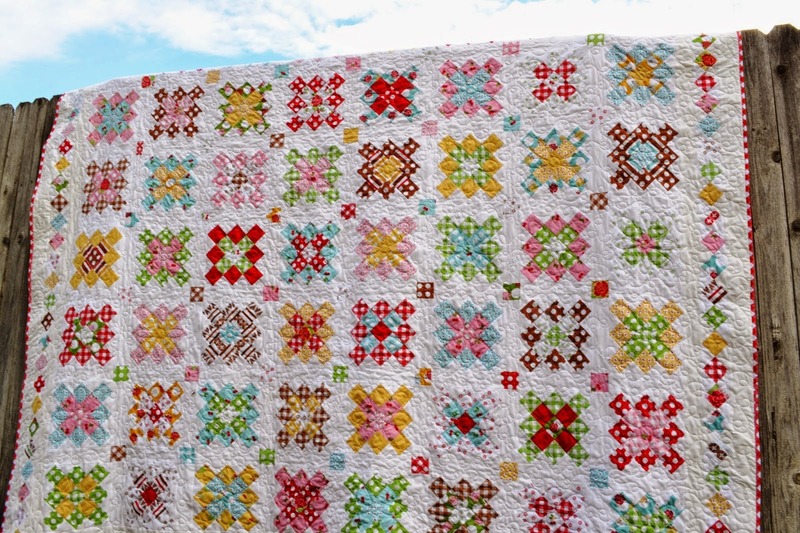 It is at a local plantation, and it is a wonderful display of the time-honored traditions of quilting. As you might guess in such a historic location, the quilts are absolutely gorgeous, but definitely very traditional. Well this year, they're in for a little bit of a shakeup. It's small of course (only 24" square), but I think it packs a modern punch, don't you? 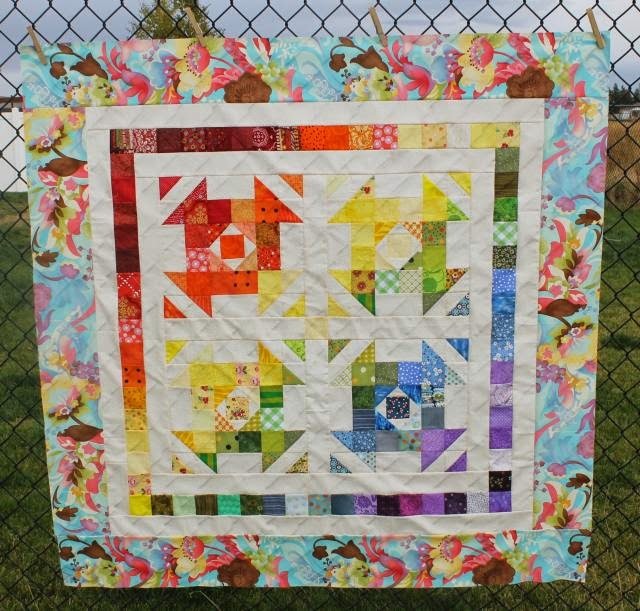 I used my improv piecing technique (sewing by color), then used those blocks with my Easy Peasy Chevron tutorial to create rainbow improv chevrons! Each HST measures 3 inches finished. I had so much fun with this one. Don't you just love projects you can start and finish within a day or two? I chose big, black and white polkadots for the backing, and I like the pop of the colors against it! I was really torn about the binding for this one. I almost used a solid gray binding, but I wanted something a little more interesting. I decided on this type-text print I had on hand, and I think it looks so cute without being distracting. This was a little bit of a risk for me, and I'm glad it paid off! 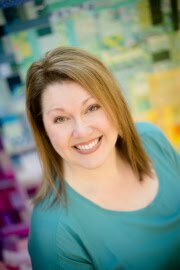 The quilt show is in two weeks, and I can't wait to show visitors a fresh, fun side of this amazing art form. Here's my only issue. 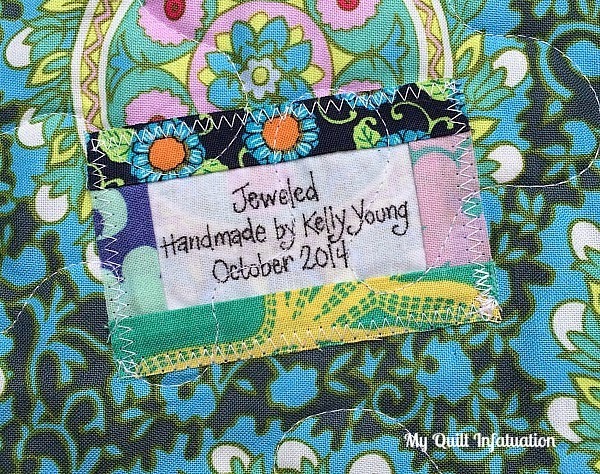 I am not a mini-quilter. This is the only mini I've ever made, and unless I have another specific purpose, probably the only one I will ever make. I really like this quilt and it was fun to make something so quickly, but beyond the show, I don't know what I'm going to do with it. I know I could hang it on the wall, but I don't really have the wall space. I know I see tons of minis out there in the blogosphere. So tell me, what do you do with them? Edited 10/26- Since Blogger's Quilt Festival is going on right now, someone suggested that I enter this quilt in the mini category. Makes sense...why didn't I think of that? So, this is my second entry in the festival. Shattered Rainbow is entered in the ROYGBIV category. 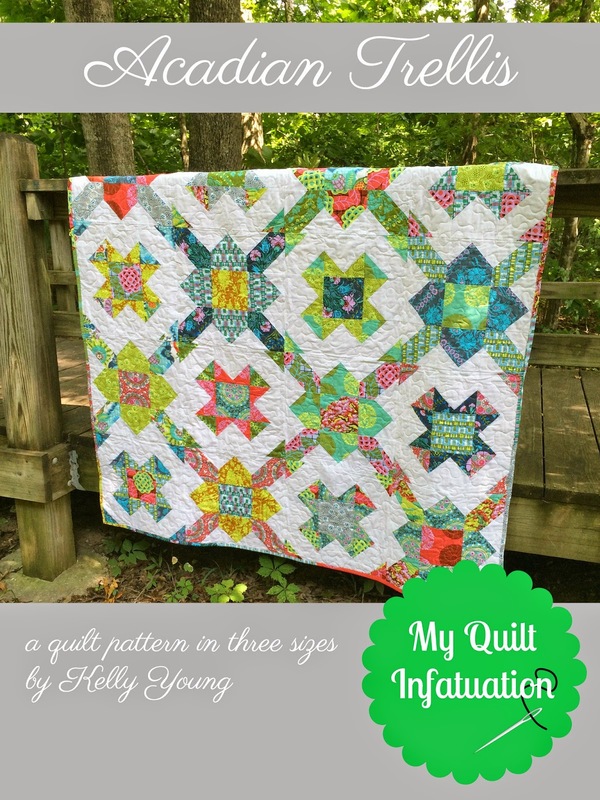 You can find this, and other amazing quilty inspiration on over at Amy's Creative Side. Pop over and check it out! 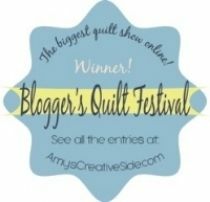 I can't believe it's time for another Blogger's Quilt Festival! 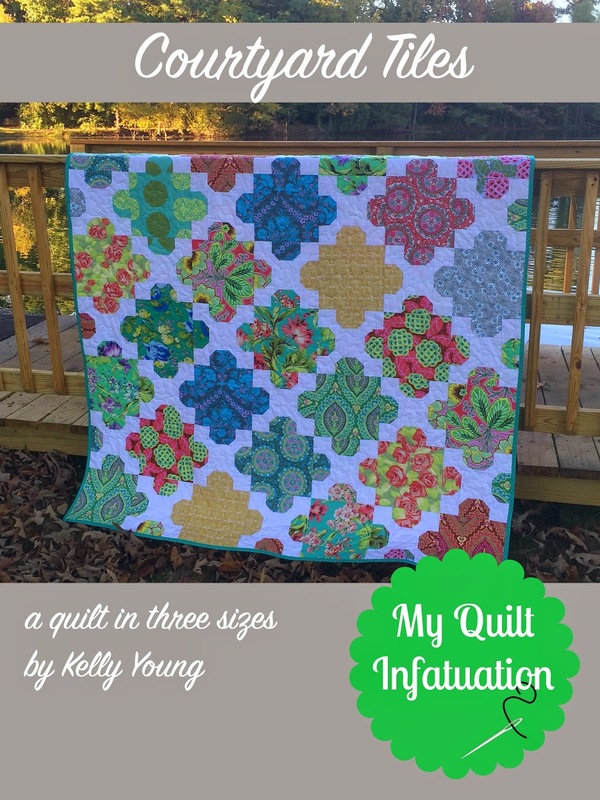 When I was trying to decide which quilt I should enter in this one, my choice was clear. I've decided to enter Shattered Rainbow in the ROYGBIV category. Of all of my quilts, this is one that I feel especially proud of for a few different reasons. 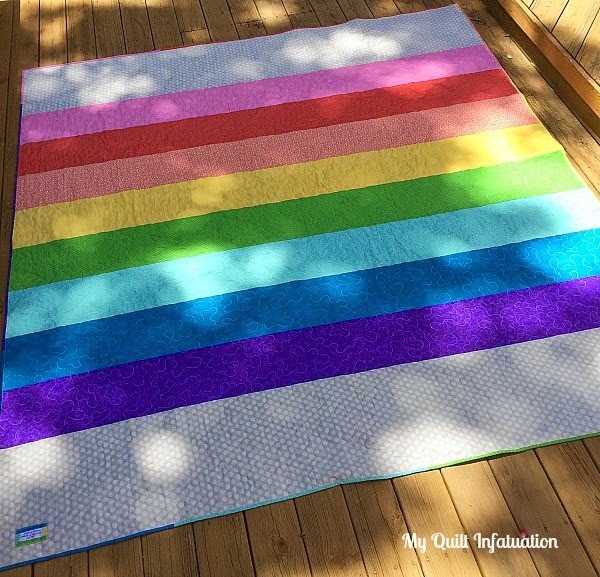 This was my first rainbow quilt, and the first time I attempted to blend colors gradually around a quilt. Another little victory with this quilt is that I planned my binding. Each section of the quilt is bound in the corresponding color. 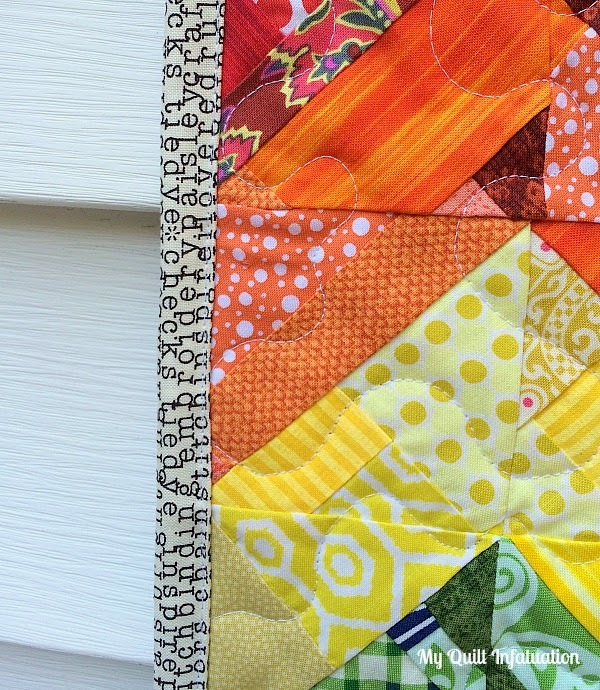 I love that the binding doesn't detract from the color layout of the quilt. 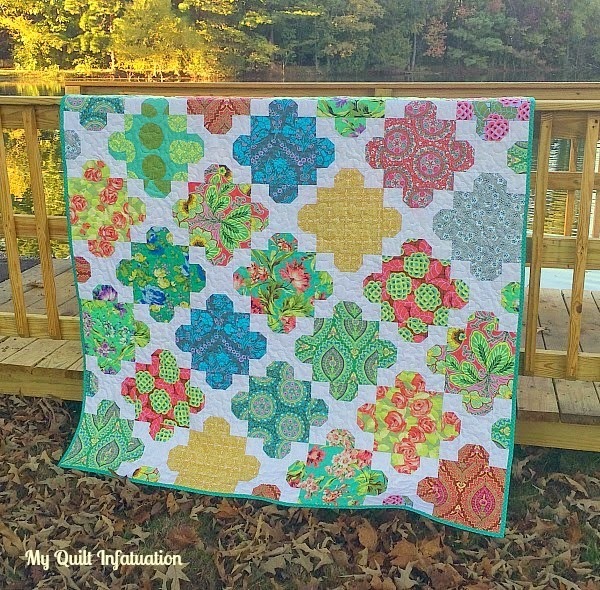 Most of all, it always feels wonderful to use up all of the scraps in my scrap jars, and with this quilt, I accomplished that! 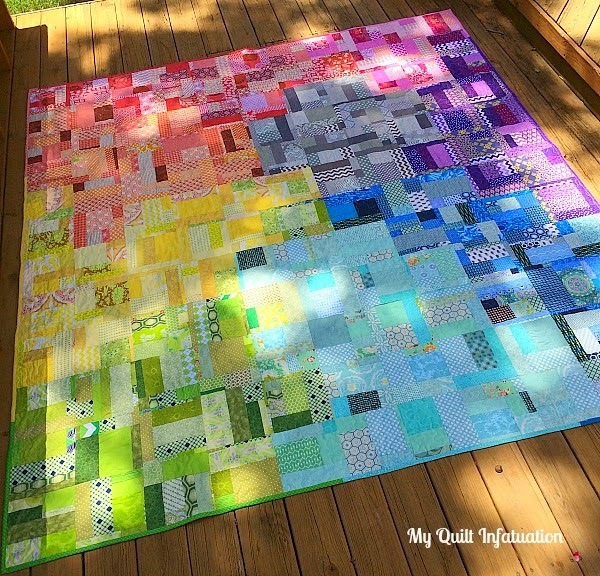 The quilt measures 88" x 96," so that's a LOT of scraps! 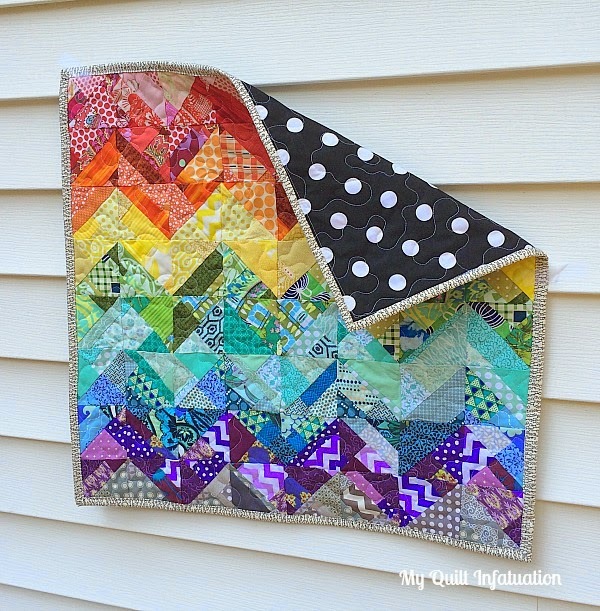 I pieced the backing with wide rainbow stripes, bordered by a dreamy gray polkadot. I thought it looked soft like a cloud! All in all, this quilt is one of the finishes I have been most proud of! Size- 88" x 96 in. *Edited 10/25- Since I've had a few people ask me, I used THIS method for my improv piecing. The only difference is that I made 8 inch blocks instead of 12 inch, and of course I sewed one color at a time. 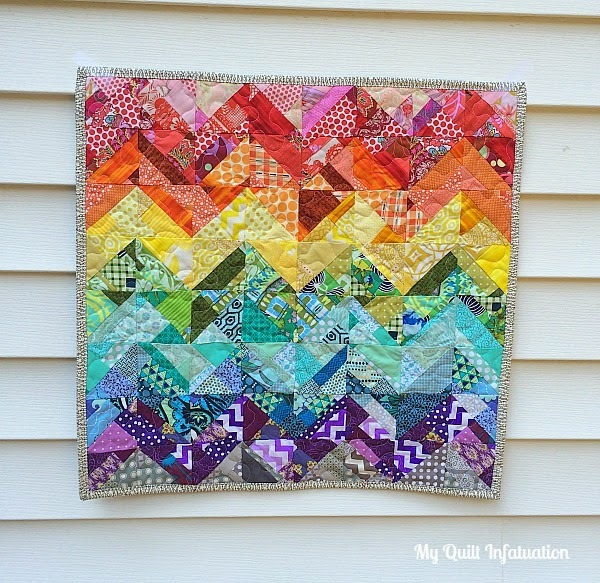 So, if you get the chance, pop over to Amy's Creative Side to check out all of the fabulous quilty inspiration in the ROYGBIV category, and all of the others! Courtyard Tiles Pattern is Finished! I stayed up super late last night to finish my Courtyard Tiles quilt pattern. I was in the quilt math groove, and just had to do the final checks over my numbers. The quilt is written for lap, twin, and queen sizes, and the illustrations and instructions are very detailed. It is now for sale in my Craftsy and Etsy shops, so I hope you'll hop on over and check it out! 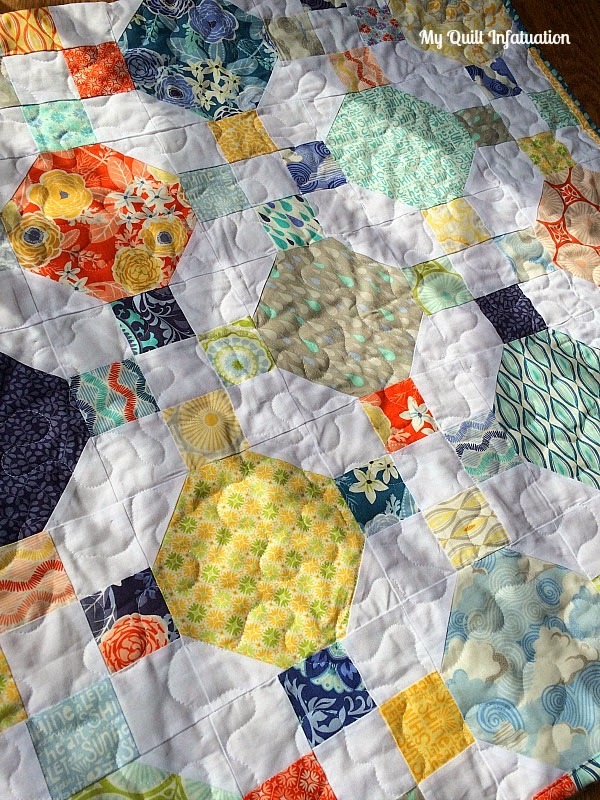 And if you missed the post, you can check out more photos of the finished quilt HERE! Welcome to Needle and Thread Thursday! 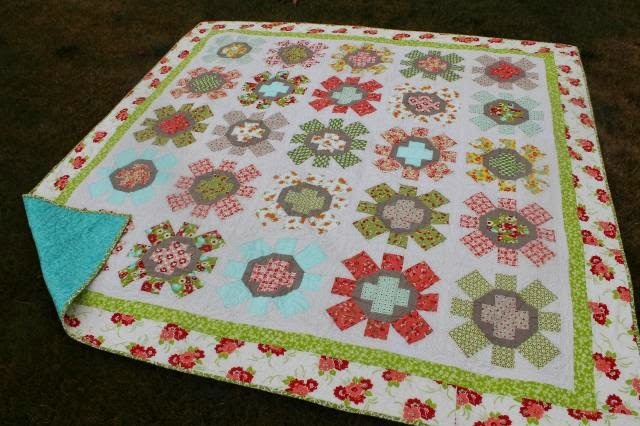 I am so humbled by the fantastic response I received about this quilt in my last post! I'm delighted that it has been so well received, and I'm excited that I can share the finish today! I finished the binding after school today, then rushed to our neighborhood park to get some quick pics before the sun went down. That is happening so much earlier these days. I could not be happier with the way this quilt turned out. I love it so much and can't wait to share the pattern! I even started working out the math last night, before the quilt was finished! I used the rest of my Amy Butler fabric on the backing. Wide, WOF stripes are great for using up leftover fabric, and I think it's even better when the widths are varied. I used the same teal binding that I used on my Jeweled quilt, because I think it works so well with these fabrics. Amy Butler fabrics are so rich in color that I have had trouble finding just the right binding in the past. I'm working like mad to get this pattern finished, so be on the lookout! 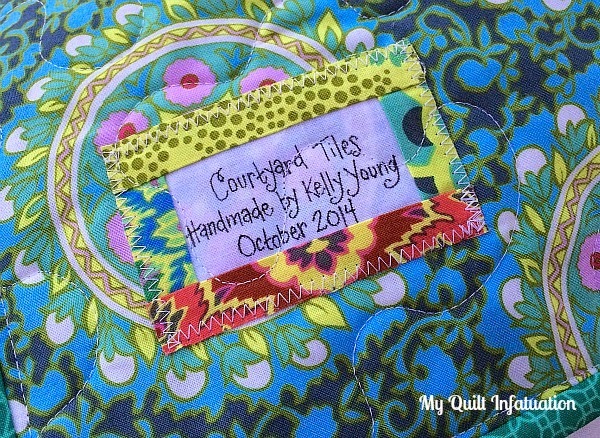 I'm calling both the quilt and the upcoming pattern Courtyard Tiles, and I hope to have it finished this weekend! Now, it's time to announce the winners from the three giveaways! 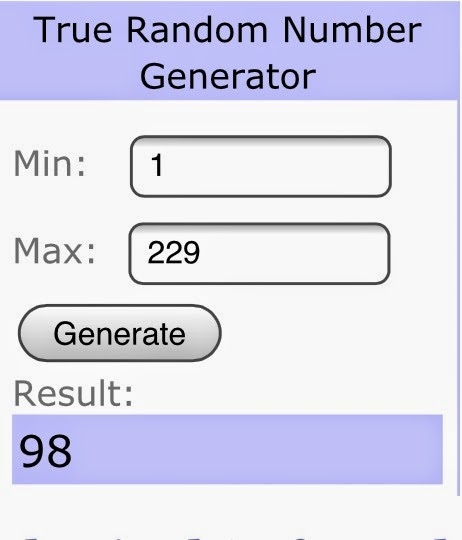 A whopping 229 commenters entered the giveaways- WOW! 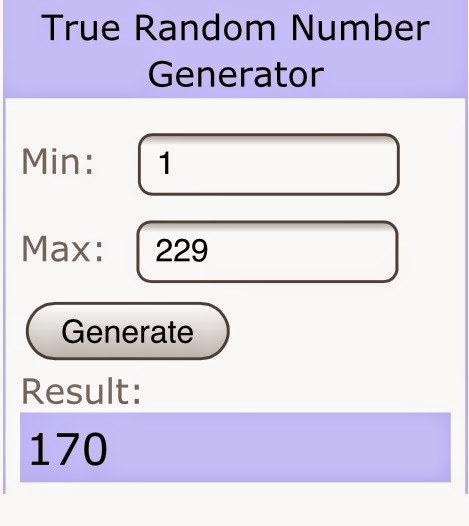 First up, the winner of my Amy Butler scraps (which is actually quite a bit of fabric), is comment number 170, Addie Polston! Love the colors! Hope I win!! Love your blog too!! 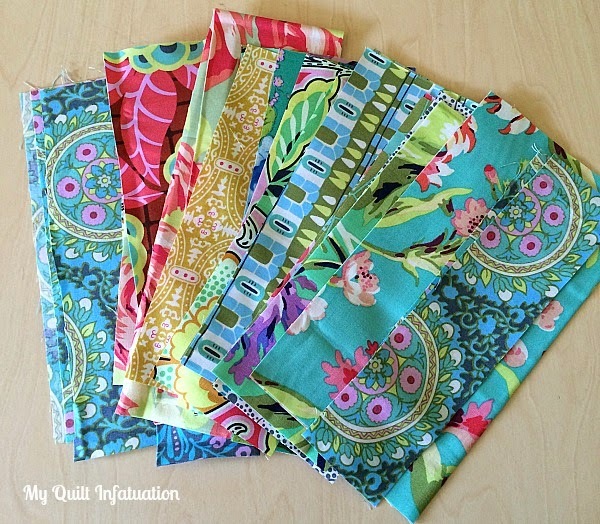 Next, the winner of the four Amy Butler fat quarters is comment number 98, TS Quilter! Beautiful quilt and I too love the pattern. 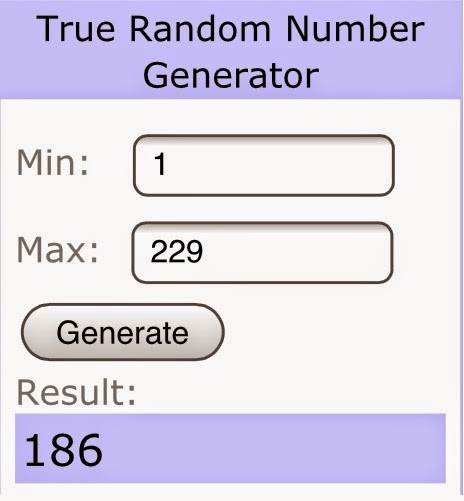 and finally, the winner of the $25 gift certificate from Southern Fabric is comment number 186, Dixie! Congratulations to all three of you! I'll be contacting you soon to get your information so that you can get your goodies! Okay! Let's take a look at some of the fantastic projects that caught my eye from last week's party! 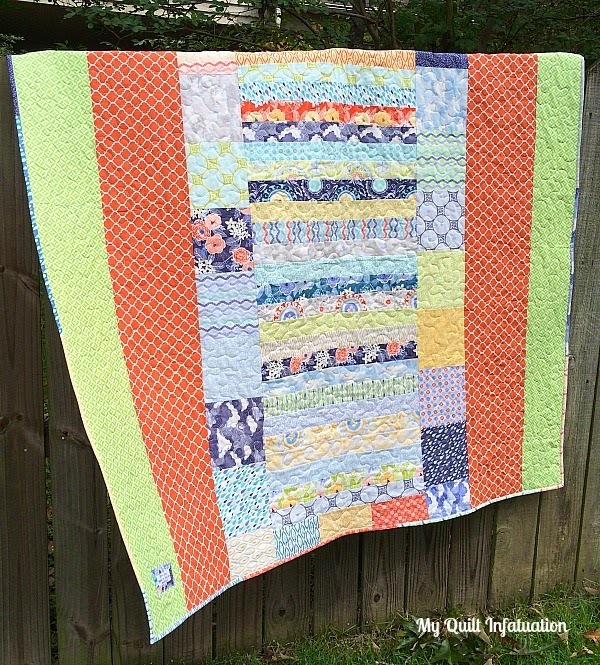 Cynthia from Quilting is More Fun Than Housework shared this scrappy, fun quilt. 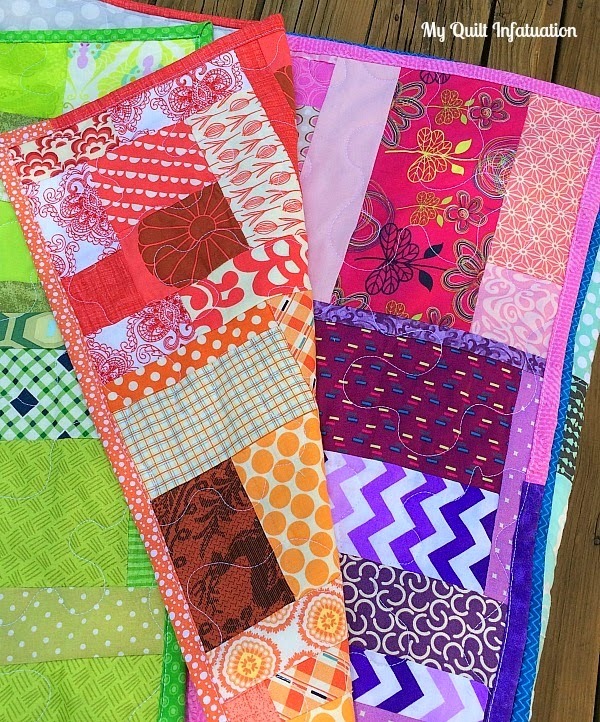 If you've never checked out Cynthia's blog, she is a master at using scraps! 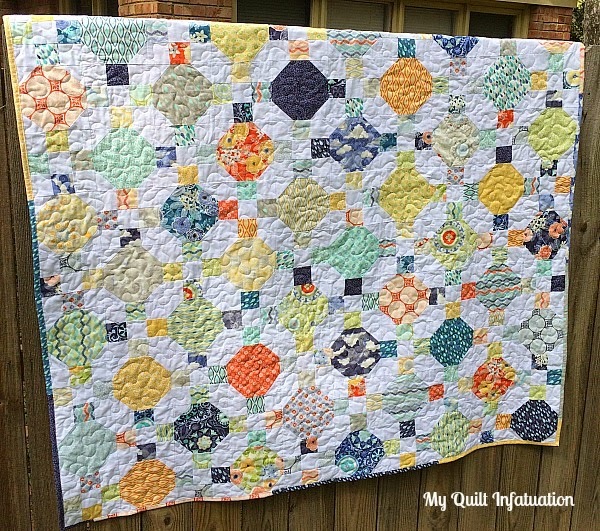 Sue Daurio's Quilting Adventure linked up this fun quilt. I know it is a team-inspired quilt, but with Halloween right around the corner, this one just makes me smile! 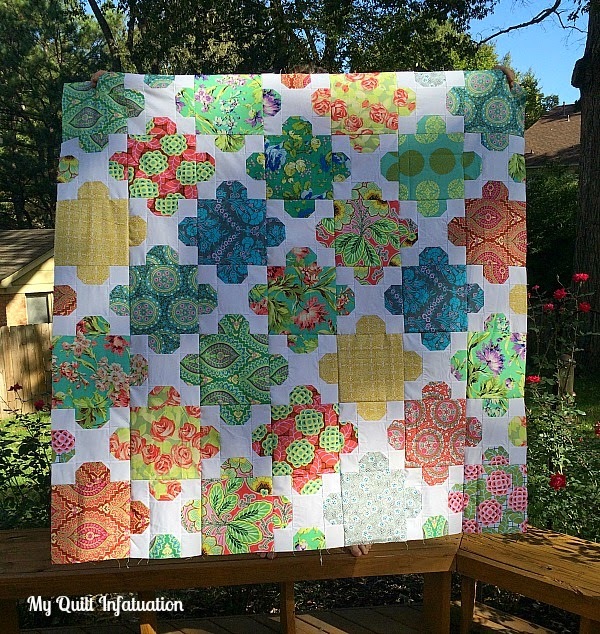 and Katie Mae Quilts showed off this cheery quilt top! So much awesomeness, week after week! Let's get down to business! This pattern was featured in Modern Quilts Unlimited magazine recently, but only in the lap size. 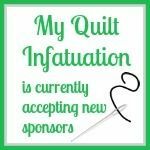 I've done all of the quilty math for you and expanded the pattern to include twin and queen sizes as well. It is available in my Craftsy and Etsy shops, so hop on over and check it out! 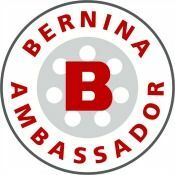 Final AB and THREE Giveaways! It is (almost) finished. I am working on my final Amy Butler quilt from my huge stash. I have some fabric set aside for the backing, and there are a few prints that I have put into my general stash that I think will be easier to mix with others. And I'm giving some away as well, so keep reading! I have been so inspired by the all of the Moroccan tile fabric prints I've been seeing lately. I wanted to make a quilt with the same interlocking tile design without having to sew curves (I'm still a chicken about that). I'm so pleased with the way this came together that I think it's going to be my next pattern! So, what about the giveaways? Well first off, I have a scrap bag with several different Amy Butler prints. There are at least a dozen different prints in this stack. The pieces are in a variety of sizes, and there is a pretty decent amount of fabric in here! I will be adding the scraps from my quilt backing as well before shipping it out. 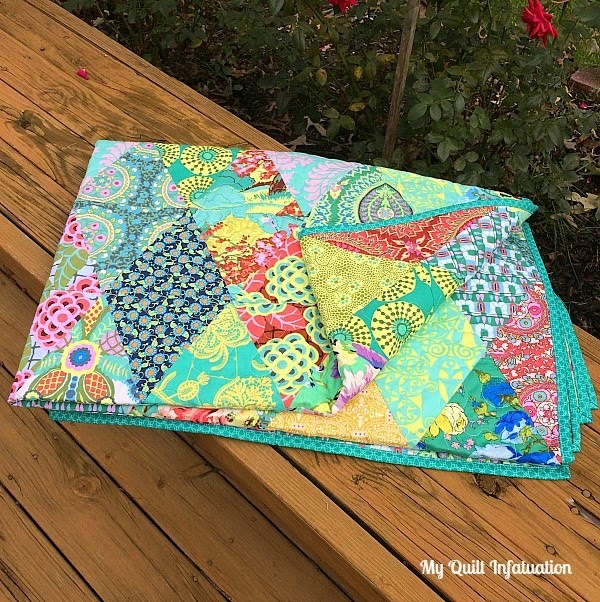 If you've never worked with Amy Butler fabrics, but want to give the bold, saturated colors a try, this would be a great way to dip your toe in the water without having to plunge into making a huge quilt. Secondly, I have cut a few fat quarters from some of the prints that I had more yardage of. Do you ever have SO much of a single fabric that you worry that you can never use it up? Well, that has happened with a few of these prints. Usually it happens when I buy something for a quilt backing, then end up changing my design. 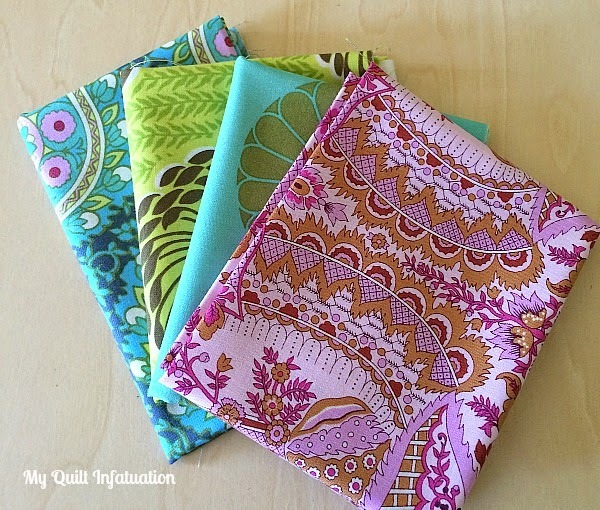 So, I'm giving away four fat quarters. Two of them are from the Cameo line (aquas), one from Soul Blossoms (lime green), and the last one is from the Alchemy collection (pink). 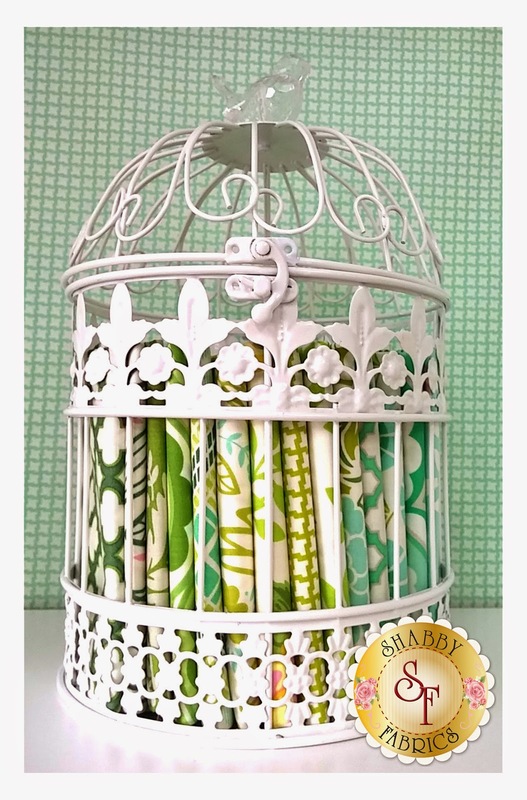 I think the lime green print is actually a quarter yard cut, and not a FQ. 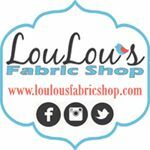 Finally, I am SO excited that I get to offer you a $25 gift certificate to Southern Fabric! 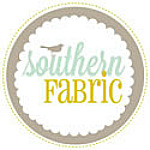 Southern Fabric is one of my spectacular sponsors, and if you've never shopped there, you are really missing out! 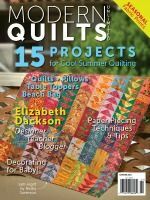 They have a wonderful selection of precuts, fat quarter bundles, patterns, notions- you get the idea! They always have a daily deal going on that is tough to pass up! They are generously offering my readers 20% off of their entire purchase TODAY ONLY! The coupon will expire at midnight, so hop on over there! 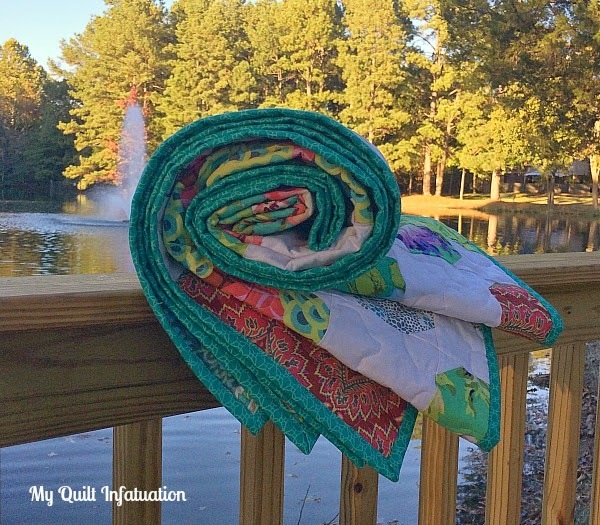 The coupon code is quiltinfatuation! Okay, so the great thing is that to enter ALL three giveaways, all you need to do is leave ONE comment below! Easy peasy! 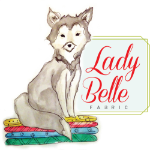 The Southern Fabric giveaway is open to all, but the two Amy Butler giveaways are open to my readers only, in thanks for being such a wonderful source of inspiration and encouragement! I will use a random number generator to select the winners next Wednesday afternoon, and announce the winners at next week's NTT party. Good luck to all and happy weekend! Welcome to another Needle and Thread Thursday, y'all! My lovely week of fall break sewing is over and I'm back to the daily grind. I managed to get this quilt basted and quilted before the weekend was out, but the binding was left for Monday night. When I was working on this quilt, I envisioned a picturesque location for the photo shoot to really show off the beauty of the fabrics and pattern, but the huge swath of storms that made its way across the country over the last couple of days has made everything soggy. Thankfully, the Memphis area just got lots of rain, without any tornadoes or wind damage. My deck isn't completely dried out yet, but it was okay for a few quick pics. I really had fun with this one and I love the way it turned out. Originally, diamonds weren't in the plan for this quilt. I had planned to do a basic equilateral triangle quilt, but when I was playing around with the layout, I loved the diamonds so much, I just had to do it. It's amazing how something as simple as laying the triangles end to end creates such a different look! The wide stripes on the backing were certainly helpful for putting a dent in my Amy Butler stash, but even still, I probably still have enough for a couple more quilts. I always try to use scraps where I can, and that includes the binding when possible. In this case, though, I knew this quilt needed a less busy binding. 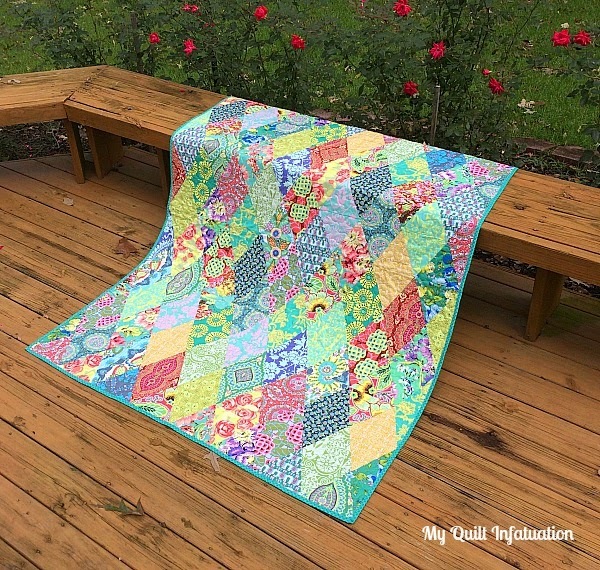 The teal tonal print is just solid enough that is contains the busy pattern of the quilt and frames it nicely. Some quilts are much easier to name than others. Sometimes, I know the name of the quilt as soon as I pick out the fabrics, and other times, I have to think about it for days. With the diamond shapes and the rich jewel tones in the fabrics, the name for this one came to me pretty easily. Okay! On to last week's NTT highlights. 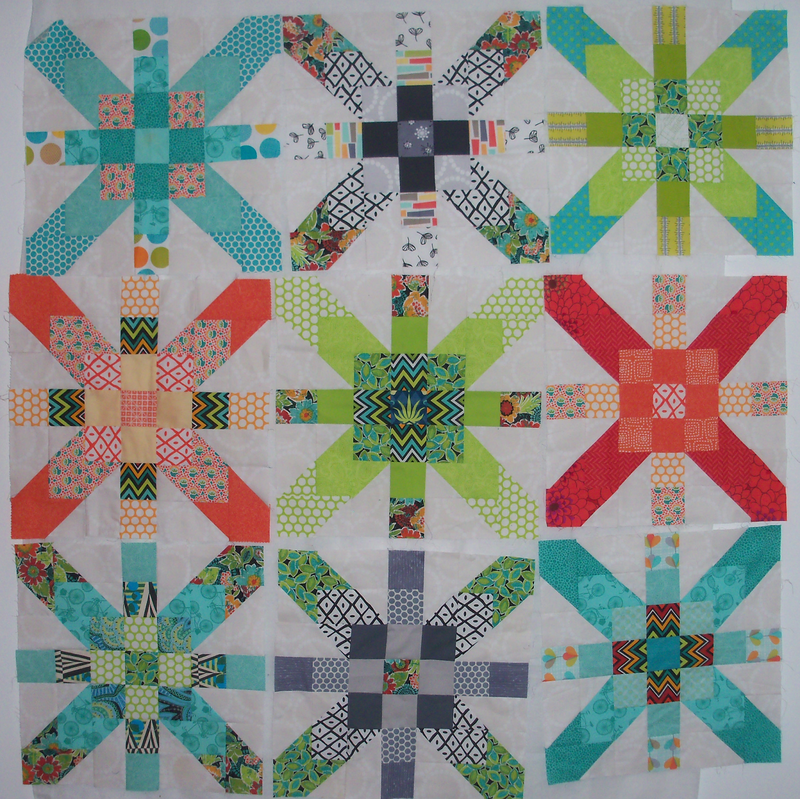 Kate at Thread Everywhere shared her Supernova blocks. This quilt is going to be fabulous! 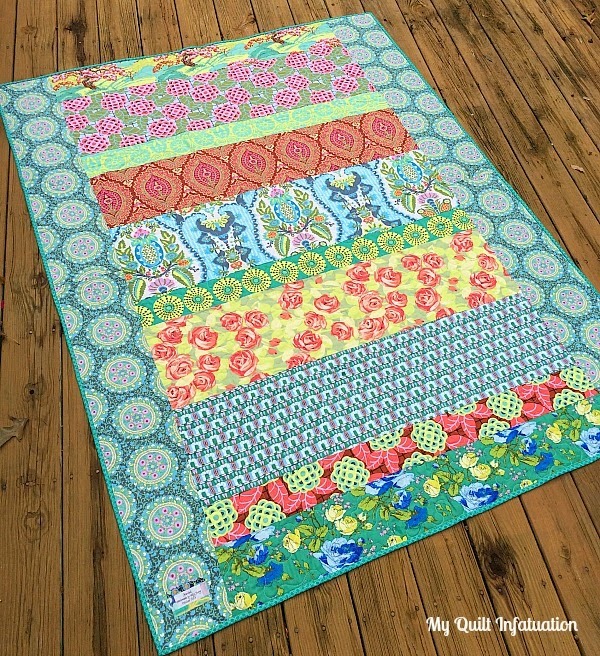 Janet at Simply Pieced showed off three different projects! 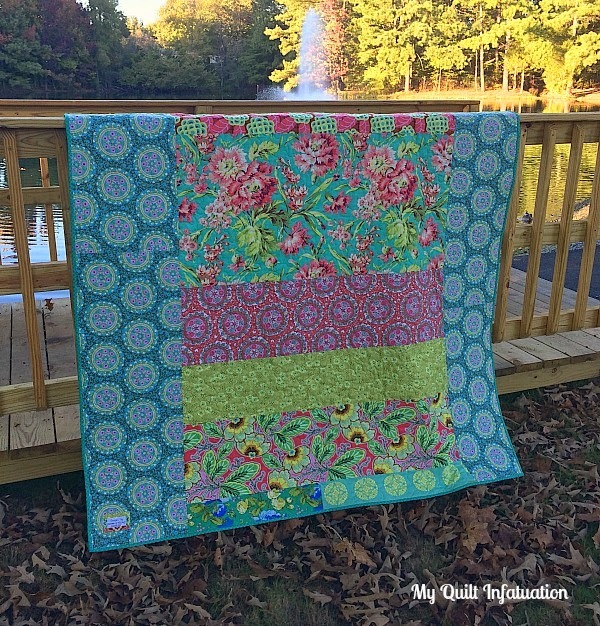 If you missed her XPlus quilt, you should definitely check it out, but take a look at what she made with the trimmed corners from it. What an amazing use of scraps! 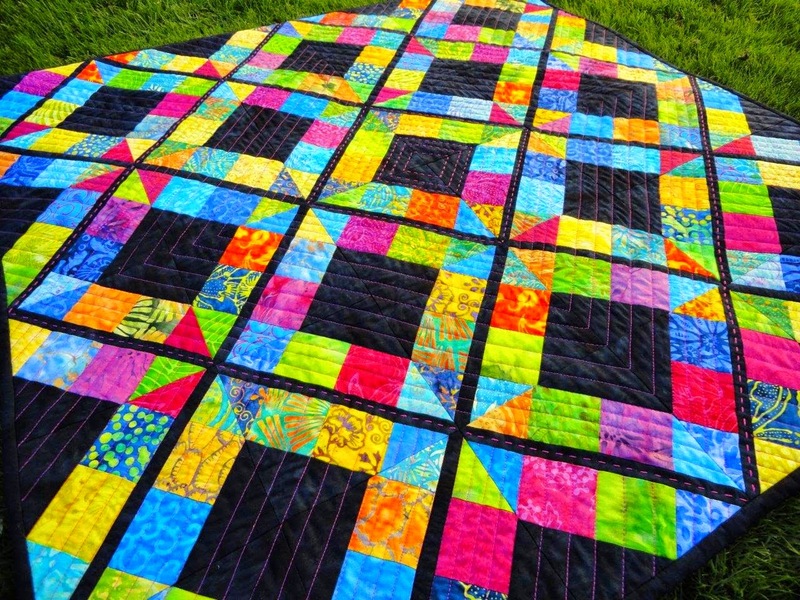 and Wendy's Quilts and More linked up this bold beauty! I just love browsing your links week after week! Thanks for all of the inspiration. Let's link up, shall we? So, here's the deal. You all know I love Amy Butler fabrics, and through no fault of my own, I have amassed quite a hoard of it. Okay, maybe I'm at fault just a little bit. At one time, I probably had over 30 yards of Amy Butler fabrics, in 42 different prints (I counted). Yikes! That is a LOT! Little by little though, I am chipping away at it, which is why I've made so many quilts with them. I am ready to bust my stash. 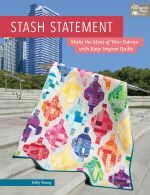 I have considered separating them by color and mixing them with others, but Amy Butler fabrics are so bold and vibrant that it can be tough to do that. Anyway, all of this is to say that I am working on another Amy Butler quilt, and this one really is one of my favorites. It all started when I designed Acadian Trellis for Modern Quilts Unlimited magazine almost a year ago. I used 16 different Cameo prints, and ended up with quite a lot left over. Westminster Fabrics graciously provided the fabrics for that quilt, and they were very generous with their cuts. 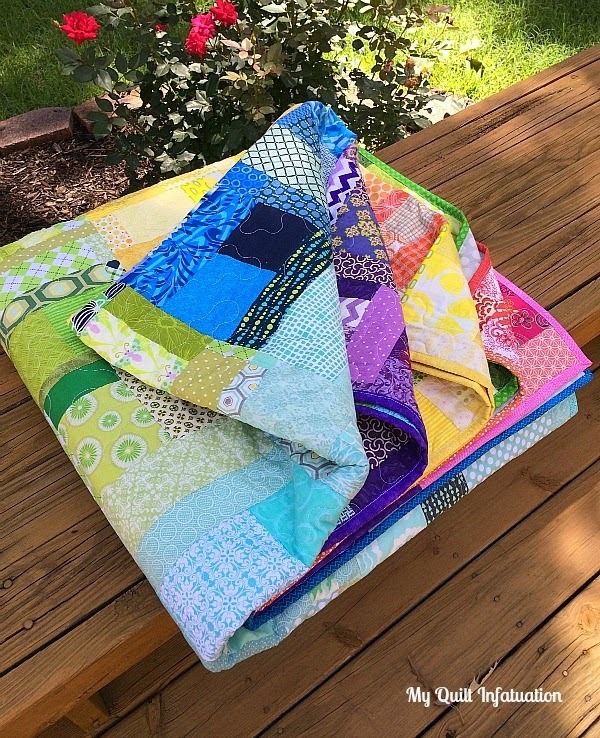 The rest of my Amy Butler stash was collected for a custom twin sized quilt over the summer, and then the customer found other fabrics she preferred. To be fair, I ordered the fabrics before she completely committed to them because the thought of all of that Amy Butler made me a little giddy and I lost my head. Other than that, I have collected a print here and there, but nothing major- honest! The good thing is, when I sold my Unruly quilt, two other people wanted a quilt made with similar fabrics, so this is one of those. I didn't have to hunt down the fabrics I needed because they were already sitting right there on my shelf! 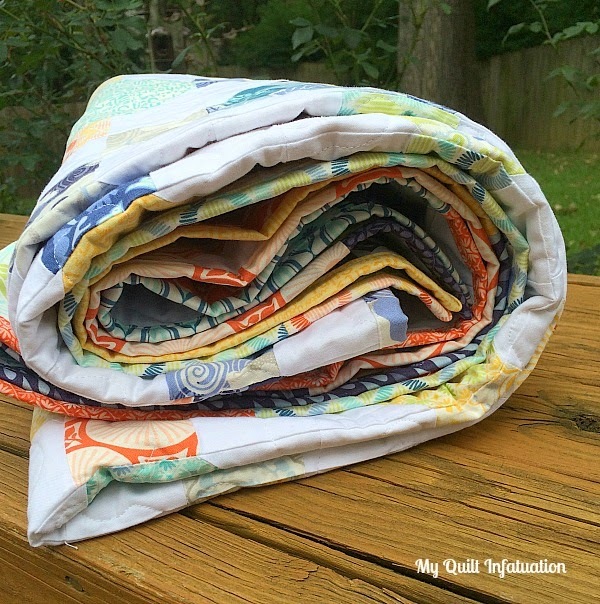 As much as I love Amy Butler fabrics, I have to admit that I'm ready to use them up. I have been cramming a lot of sewing into this Fall Break "staycation" and finished up my Sunnyside snowball and nine patch quilt yesterday! I love the colors in this fabric collection, and I think that the white background really keeps it light and airy! One thing about this pattern- there is a LOT of seam matching. The blocks themselves are pretty straightforward- just snowball and nine patches (six inches finished) with cleverly placed white squares, but it's when the blocks go together that things can get tricky. A consistent 1/4 inch seam is crucial to getting all of the nine patch squares to line up perfectly with the edges of the snowball block. For the most part I did okay, but there are a few places on the quilt where my alignment wasn't perfect. I don't think it takes away from the quilt as a whole though; it's just a bit annoying. On the back, I used up every single scrap, along with wide stripes of orange and green. The Sunnyside fabrics have so much blue and gray, and I really wanted some contrast and color pop on the backing. I had a fat eighth bundle of these fabrics, and the pattern left a perfect 2.5 inch strip of each one. I took that as a sign from above that this quilt was begging for a scrappy binding, and I really love it! 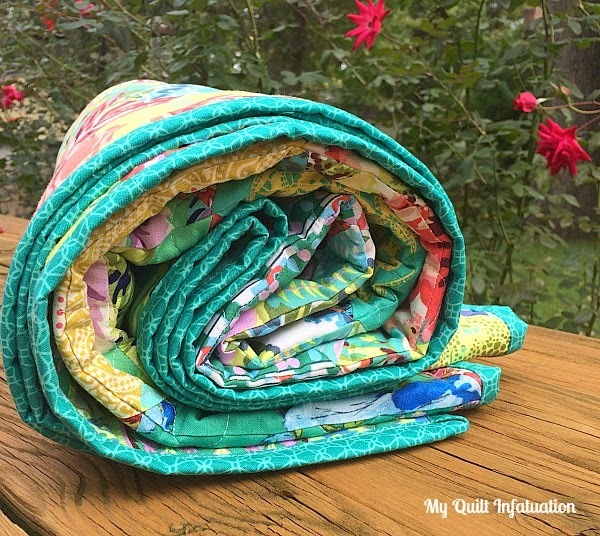 Sometimes, I think that busier quilts need a solid binding to contain the crazy a little bit, but with all of the white in this one, the scrappy binding works! 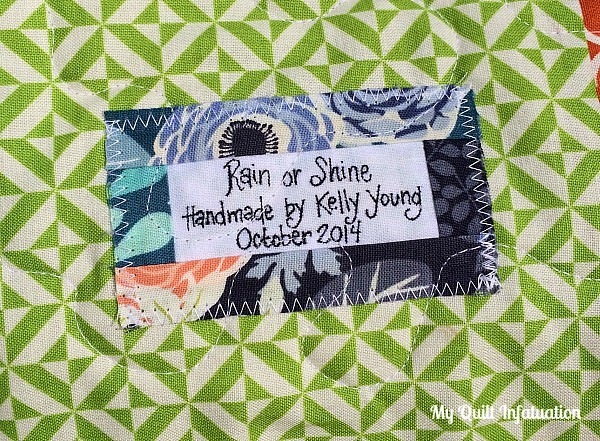 If you've never seen this fabric line up close, it has some really cool prints that include raindrops, clouds, and a cute text print. It is whimsical without being overdone and feeling like novelty fabric. In the close up photo above, you can see a good shot of all three. It's fun, but subtle enough that it doesn't look themed. I decided to use this subtle design as inspiration for the name. After working on Hush, Little Baby, it feels wonderful to finish a quilt that I really love, that feels much more "me." Scattered Maple Leaves, a Giveaway, and NTT!